The beautifully animated film ‘The Snowman‘ formed the basis of several groups’ final Christmas and Winter themed lessons. We firstly learnt some warm winter clothing nouns, then we had fun either trying them on or winter dressing a live ‘snowman’. However, what is a winter without Christmas? So, over the final lessons we played with Christmas words, outlined Santa’s tasks, and sang Christmas songs. And to top it off we created funny old Father Christmases of our very own. The older classes in Križ and I managed to finish our Gruffalo project together before the closing of 2012. We watched the entire BBC Animated adventure over a period of several sessions, mixed in with readings from the adorable picture book. We continued with descriptive worksheets of the forest scenes; Mouse meets Fox; Mouse meets Owl; and Mouse meets Snake. And Mouse’s descriptions of the Gruffalo; his description to Fox; his description to Owl; and his description to Snake. In our final lesson we brought the unit to an end with a dose of reality by looking at which real animals share the Gruffalo’s various features. The final Sveti Ivan primary school project of 2012 was a two week project concerning robots. We began our first session with a look at the distinction between real and make-believe robots by watching some wall-e shorts and the Honda Asimo commercial. Then we started working with some humanoid robotic worksheets to learn the names of humanoid body parts. We began by looking at the head, then we continued to the basic body nouns, and finished off with naming our main movable joints. At the end of our first session we got funky, and got up from our chairs to dance robotic Gangnam style. It was fantastic. The second session of the project was also ‘Christmas week’, so we had a robotic Christmas session. I first attempted to amaze the young learners with a look at icub. It worked! 🙂 So, as a class we took the opportunity to translate the video’s key verbs into Italian and Slovenian. We next looked at some Christmas vocabulary with the help of some internet generated worksheets and then got robotically funky again with Electronic Santa Claus. 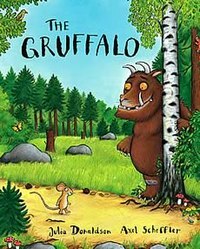 I was delighted to discover that the kids at the Križ primary school had yet to discover the gleeful tale of The Gruffalo. So, a new children’s literature project was born. We started the journey by looking at the story’s incredibly intelligent heroic mouse and watching a part of the beautiful animated adventure. We then went on to examine the meeting of Mouse and Fox by pinpointing some of the scene’s features and by reliving how Mouse had described the gruesome Gruffalo. Here is the template which started the creative juices flowing. Following on from Wallace and Gromit‘s meeting with the luna-robot, I thought that we would have some more robotic fun for ourselves. We began the session with some youtube enhanced discussions concerning real and make-believe robots. Firstly we looked at a Wall-e short, which the children correctly identified as make-believe. Then we watched a Honda commercial featuring Asimo. I explained to them that Asimo was indeed a real robot, but that he needed a squad of technicians on hand to program him even for ‘simple’ tasks. Some of the children seemed relieved to hear this! Earlier this week some of the children began their first Wallace and Gromit project, based on the duo’s first animated adventure: ‘A Grand Day Out‘. We started out by watching the film, which all of the children seemed to love, and then we went on to a comprehension exercise. 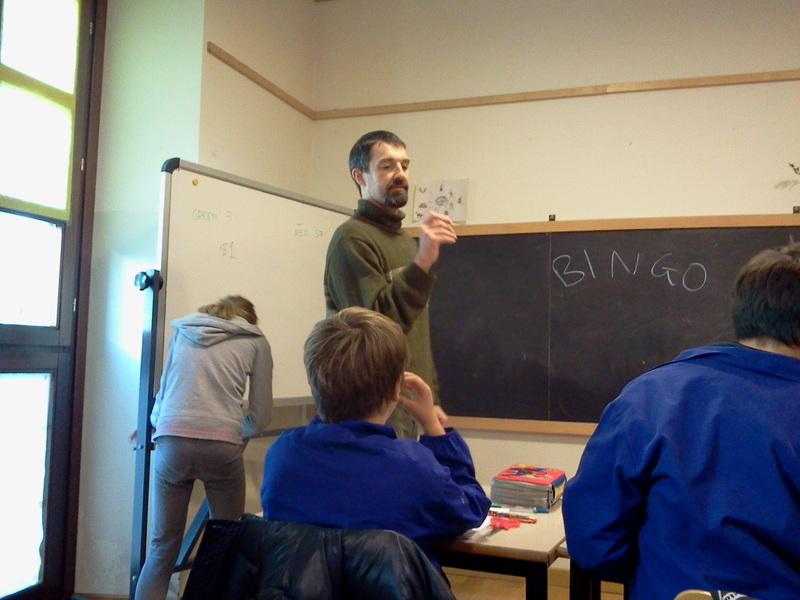 With the youngest classes we completed simple comprehension sentences, while with the slightly older classes answered some comprehension questions. The remainer of the lesson was spent on either building our own rocket-ships or designing our very own luna-robots. So while we have been using explanatory worksheets in various forms depending on the class, I have also tried to inject a little active enjoyment with games of Bingo,with or without number restrictions, and by crafting and playing number wheel games and countdown rocketships. As a part of our Halloween book project a number of classes this week are exploring the features of a red dragon which stars in our Halloween book choice. This little dragon has big yellow eyes and sharp white horns. He has red scaly skin, but his wings are pink and his belly is white. 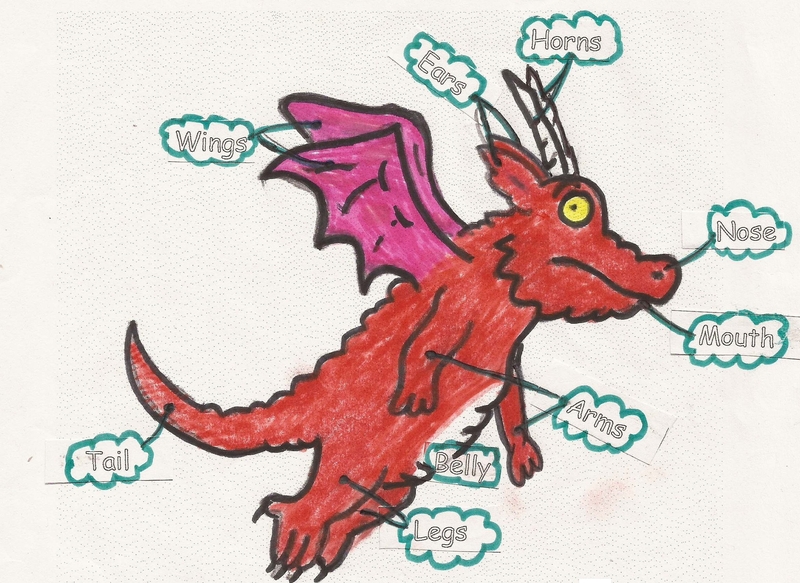 There are two versions of the worksheet, one for my younger learners, which includes labels for cutting and sticking, and one for slightly older children, which includes a number of ‘mastery questions’. I hope that somebody else finds them useful.